Announcement *** SHOP NOTE*** Please note that my shop will be on vacation from SATURDAY APRIL 13 to SATURDAY APRIL 20, 2019. Any orders that are placed during this time will be shipped by the end of the day on Sunday April 21, 2019. Thank you!!! Welcome to Millie Mae Clothing! I release new collections every few weeks! Please follow my Facebook page at www.facebook.com/MillieMaeClothing for sneak peeks and updates! *** SHOP NOTE*** Please note that my shop will be on vacation from SATURDAY APRIL 13 to SATURDAY APRIL 20, 2019. Any orders that are placed during this time will be shipped by the end of the day on Sunday April 21, 2019. Thank you!!! 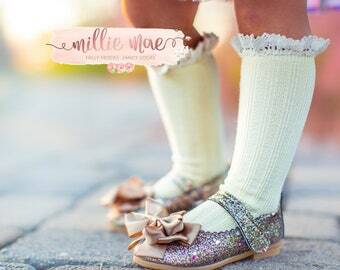 Girls Knee High Socks Crochet with Ruffle- Available in Multiple Sizes and Colors! 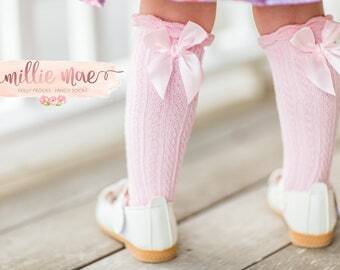 Baby Girl Knee High Socks Crochet with Ruffle- Available in Multiple Colors and Sizes! 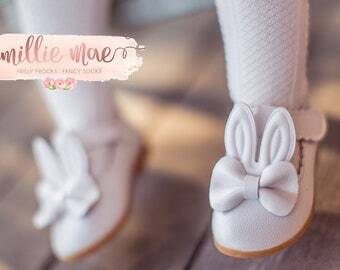 Girls Ankle Socks with Lace and Bow Detail- Available in White, Pink and Navy! 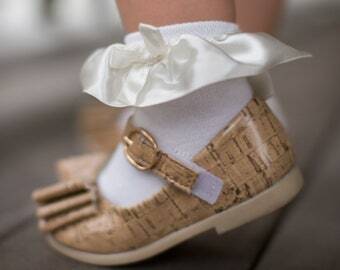 Girls Satin Ruffle and Bow Ankle Sock- Available in White, Pink and Navy! 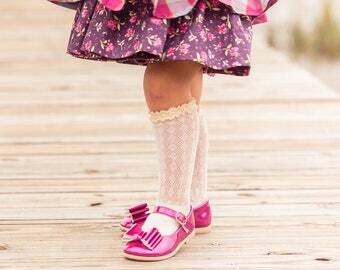 Girls Knee High Socks with Crochet Trim and Bow- Perfect for School Uniform!! 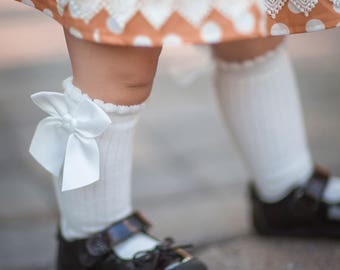 Baby Girl Knee High Socks with Bow- Available in Multiple Colors!! 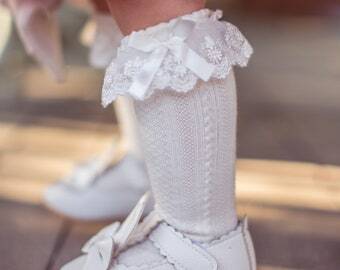 Girl Knee High Socks with Ruffle- Fits ages 2-4! 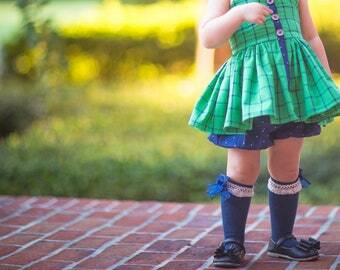 These socks were a perfect addition to her vintage ensemble! These knee high socks were perfect for our Easter pictures!! Loved them 😍 Thank you! Millie is for my Grandmother and Mae is for my daughter. 4 generations of handcrafted love ❤️ I can't wait to share our passion with you! I am a loving Mom of 4 crazy kids!! I have sewn for as long as I can remember, beginning with a purse company before children came along :) With the addition of our daughter to our family, my passion for girls clothing began!